These are a Painted Nest Of three wooden Tables In Farrow And Ball Skimming Stone. They do have a few marks and scrapes here and there. We have a fab Nest Of 3 Tables. Refurbished into a shabby chic style with the legs in Dove Grey and the tops walnut veneer thats been rubbed back and treated for a gorgeous look. The legs are in a Queen Anne Style with Ball & Claw Feet. The tops have gorgeous fancy edgeing. Very french/shabby chic look. The dove grey compliments almost any colour room. Sizes : Large 20" wide x 15" deep x 21.5" high Medium 16" wide x 13" deep x 20" high Small 12" wide x 11" deep x 19" high We have other items listed, please look. Collection from Hatfield, DN7 (Or we can wrap for collection by customers own arranged courier) ... LOCAK delivery can be organised for small fee, please ask. Depth 60cm. Height 50cm. Top is oiled for durability. Collect from Staple Hill, BS16. SOLID PINE CONSOLE/HALL/DRESSING TABLE PAINTED IN FARROW & BALL ‘OLD WHITE’. UNDERCOATED AND PAINTED IN FARROW & BALL’S ‘OLD WHITE’ ESTATE EGGSHELL PAINT THEN GIVEN A COAT OF CLEAR BRIWAX TO PROTECT THE PAINTWORK. An antique victorian mahogany small oval dining table set on carved cabriole legs with claw and ball feet sizes = 100 cm w x 129 L x 71 h.
THE COFFEE TABLE HAS BEEN PROFESSIONALY HAND PAINTED IN THE COLOUR OF CASTLE GRAY FARROW AND BALL. HERE WE HAVE A LOVELY CHUNKY LEGGED SOLID PINE SHABBY CHIC COFFEE TABLE. THE COFFEE TABLE HAS BEEN DISTRESSED AND WAXED TO GIVE IT A GORGEOUS AGED EFFECT. Circular/ROUND COFFEE TABLE PAINTED IN FARROW & BALL down pipe with copper clock face. This is a lovely sturdy little table that has been undercoated then painted in Farrow & Ball’s ‘Down Pipe’ Estate Eggshell paint and finished with a stencilled clock face in copper coloured paint to the top. Following the Chippendale fashion with the rounded ends, carved rope edge and claw and ball feet. Here we have an early 20th century wind out dining table. Raised on castors and fitted with a hidden fold out centre leaf. Pie crust table.veneered top could bs burr walnut ball and claw feet. Pie crust coffee table. Veneer top. could be burr walnut. Ball and claw feet. This beautiful coffee table has been hand painted in Farrow & Ball “Downpipe” with a clear wax finish. The table is a good size and has a glass shelf underneath. The table is sturdily made and is quite heavy. Lovely drop leaf side table. This has been painted with Farrow and Ball paint in Oxford Stone, lightly sanded and finished with clear wax. The drawers have been painted with Artisan stone effect paint which has a rough effect to imitate stone. The back of the table has false drawers so looks good from all angles. This is an old piece and so not perfect. The surface has a few very small dents as shown in the pictures. Please see final picture for measurements. Viewing welcome. Pick up only from WN2. This beautiful extending oak top farmhouse table is available with either one or two extension leaves, and either a waxed or oiled top. The legs on this particular table can be removable if required. This stunning Victorian Claw and Ball Dining Table is in excellent condition. It should seat up to 8 people in its largest formation. This is a well made table that will certainly turn heads and is in a very good antique condition throughout. HERE WE HAVE A GORGEOUS DECORATIVE HAND PAINTED SOLID PINE NEST OF THREE TABLES PAINTED IN THE COLOUR OF LIGHT BLUE BY FARROW AND BALL. LARGE TABLE. SMALLEST TABLE. HEIGHT 43.5 CMS. WIDTH 52 CMS. An antique edwardian dining table a small oval mahogany table with a crimped edge set on carved cabriole legs and claw and ball feet on castors sizes = 137 cm L x 105 w x 74 h.
This gorgeous coffee table has been painted with Annie Sloan 'Graphite' and sealed with clear wax. The detail on the ball and claw feet and the carving on the top of the leg have been brushed with 'bright gold' gilding wax. H- 46cms W- 89cms D- 46cms As with all hand painted furniture there may be some small imperfections or evidence of a past life. Collection from Bolton BL1. Delivery to most of mainland UK is FREE. Please confirm by messaging with your postcode before purchase. Scottish Highlands and Islands and Ireland please get in touch so we can get the best price and service for you. Payment can be made by PayPal, bank transfer or cash on collection. Table missing castors to legs. Length 163 Cm. All solid oak. On casters. Letchworth Green House Market. An antique edwardian dining table a small oval mahogany table with a crimped edge set on carved cabriole legs and claw and ball feet on castors sizes = 137 cm L x 105 w x 74 h NOTE : I HAVE 4 MATCHING CHAIRS LISTED. see last pic. 3ft6” / 106cm round Height:75.5 cm. Painted in : Farrow & Ball ‘Railings’. Lovely round pine table. The solid table top sits on stylish legs. For transport the table can be dismantled. Table ONLY £199. Pine dining table and chairs. Great stylish piece ready to grace your dining room or hallway. In a lovely condition, the graceful half moon shape of the table top is supported by 4 elegant legs with claw feet. This attractive table has been hand painted in "Dove" grey Vintro chalk paint. The whole table has been protected with Vintro's clear wax. Height 48cm. 6ft 6” Farmhouse dining table refectory kitchen Farrow & Ball railings. Pine farmhouse dining refectory table. Custom made dining tables & matching benches! The top is a chunky 1 1/2”. In ‘stripped pine’. Large old farmhouse table with a sanded and clear waxed thick butchers block type top - lots of lovely grains and knots in the wood. The underside is painted in Farrow & Ball Railings a deep rich grey. This table would look great with modern or old style chairs. Measures L 198 cm W 91 cm H 79 cm Collection only Hazleton Nr Northleach GL54. French Gueridon Table In A Farrow And Ball Grey. French Gueridon Table In A Farrow And Ball Grey. This gueridon table is offered in very good condition. The table has a round Carrera marble top with concentric rings. The mahogany carved base has been painted in a Farrow and Ball grey. Th base has been slightly shabbied and given a clear wax finish. The dimensions are 920 mm overall width 730 mm overall height Dimensions Height = 73 cm (28.7") Width = 92 cm (36.2") Depth = 92 cm (36.2") If you have any issues collecting in person you may enquire to whether we can deliver. Deliveries are subjected to availibility. If we cannot deliver and a courier is required we ask that you the customer organise this. The table top has been sanded back to reveal the wonderful grain and knots, then enhance with a Danish Oil which gives the table top a water resistant finish and family friendly surface. WATER RESISTANT TOP TABLE = DANISH OIL. FARROW & BALL PAINTED IN SLIPPER SATIN. Finished in Farrow & Ball French Grey. We use the best materials such as Farrow & Ball paint. 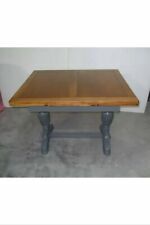 Shabby Chic Solid Pine Coffee Table. Rustic Natural Pine Top. Black Iron Handle. A very good looking well made and substantial piece in good antique condition throughout. Width:- 210cm middle leaf 40cm so without the leaf the table is 170cm wide. Beautifully looked after coffee table approx 9 years old, bought from new. Root Ball Table ONE OF A KIND! 6ft X 4ft x 3ft high Collection in person only. TOTALLY UNIQUE! This beautiful pierce was hand made by a professional joiner (my father in law) who purposely made this for our wedding 8 months ago. But now we no longer have the space to keep it. It was nearly the highlight of the wedding, all the guests were blown away by it. It looked amazing, we used it as a cake stand with a variety of cakes. It’s been treated with high grade materials to look after the wood. Which is yew and beech I believe. If you’d like to have a look at it then that an be arranged. If you have no way of collecting it then we can discuss in person the options. Finished in Farrow & Ball Cornforth White. We use the best materials such as Farrow & Ball paint. Shabby Chic Solid Pine Side Lamp Table. Rustic Natural Pine Top. Depth: 54cm. I operate 9 to 5 from a Desk Top.